It’s hard to believe that it’s been two years since we opened our doors at 815 Church Street, and Lynchburg you’ve treated us well. When we were first welcomed into this beautiful city, Lynchburg was going through a revitalization. From the waterfront building to the new shops opening, we relished in our time getting to know the local antique shops, tea houses and the incredible restaurants. But it’s the people of the area that kept drawing us back. Thank you for the open arms that immediately helped us feel connected to the community. While our experiences in Lynchburg were flourishing, there were challenges happening at home. Early last summer, owner, Becky Causey went through many hours of medical testing and after being in remission for 18 years, was diagnosed with T-cell acute lymphoblastic lymphoma in late August. Lymphoma, the most common type of blood cancer, occurs when white blood cells grow uncontrollably. With a “Glass half full” attitude, Becky began chemotherapy in September at Wake Forest Baptist Medical Center in Winston-Salem, NC. Her attitude, love of life and gratitude for those in her life, really are a testament to the type of woman she is. Sadly, so many go through this without the support of family or friends. She is preparing to enter UNC Chapel Hill Cancer Center for a Bone Marrow Transplant before the end of the year. Without this transplant, she will have a short lived life and remarkably, Becky’s sister is a match. While 70% of patients who need a transplant don’t have a family match, they rely on donor registries, like Be The Match (bethematch.org) Being added to the bone marrow registry requires a cell sample taken by swabbing the cheek and could help so many in need. Because of this news, it’s with great sadness that we are announcing the closing of our Lynchburg store. We are full of gratitude for what these last two years have given us. While this may not be goodbye forever, it is goodbye for now and will allow us to focus on getting Becky healthy again. Our huge store in Greensboro lives on with fabulous staff and amazing inventory. We’d love to set your appointment with Marti or Mikaela, so call us at 336-274-1284. You can follow us at Lotsahelpinghands.com too! Thank you for your support, understanding and love. Here’s to a New Year!! Posted on December 20, 2015 Leave a comment on Here’s to the Journey.. I have always wanted glasses; my parents wore glasses, all of my favorite book characters wore glasses, Clark Kent occasionally wore glasses- they were cool and I wanted them. My wish came true when I was ten years old. They figured out that the reason why I couldn’t pass an English test, but was reading college level books was because I couldn’t see the board to take notes. I finally had my first pair of glasses! I was so excited because I could read street signs and big bulletin boards. However, my frames were horrendous. They were small, this weird purple/ brown color, and they didn’t fit my face or my head AT ALL. I was constantly pushing them up my nose and peering through the tiny frames. When my parents figured out that I wasn’t really a contact person, my mom decided to take me to her nice glasses store so I could get some good quality frames. That was when I met Becky and I was blown away. I was twelve by this point and thought Becky was the bee’s knee. She owned her own store and she got to bring her dogs to work! Plus, like all of my other heroes, she wore glasses. I was sold almost immediately. My first pair of glasses from The View were pink. And not a pale, quiet pink, but hot, punch you in the face pink. They were absolutely marvelous and I wore them for years after. Since that first pair, years ago, I have continued to be a loyal customer of The View. Going down to 327 S Elm now feels like returning home. Whenever I am home from college, I always go down to The View to say hi and just to hang out. I now work at The View part time, but I am still blown away by new frames every day and I always leave a summer at The View with a new pair. Whether you have always been obsessed with glasses, like me, or not, there is no excuse for bad glasses. They are probably the first thing people see when they meet you. If you are willing to spend hundreds on suits, shoes, and outfits to make a good impression, why wouldn’t you want to spend the same on something that not only helps you see, but sits on your face? Go see Becky and start to make an amazing first impression every time. Beautiful eyewear, stunning spectacles or that perfect accessory. We planned our hip little optical shop to be a special place where old meets new and brown meets blue. A comfy little downtown spot, in a beautiful small southern city. Where the traditional welcome the progressive and the fashionable find their fête. A charming boutique to visit when it’s time for new spectacles. The View in Lynchburg is the perfect place to select the item you will wear for hours, days, weeks, years and even decades for some. Yes, that accessory that will be worn with all those different shoes, ties, suits, dresses, uniforms or bathrobes. Take your pick. Perhaps like most of our clients, you realize there’s not one pair of shoes suitable for everything in your closet. Maybe you never realized you have options, choices and loads of variety. From materials to designs, coatings, colors, shapes, styles, fits and functions; It’s all part of the experience. Take your time, open your mind and enjoy the process of selecting your most important accessory. Call us, make an appointment, bring your eyeglass Rx, and we’ll certainly surprise you with our expertise, options, inventory and personality. Come visit, share a coffee, tea or bubbles and enjoy all the wonderful views from Paris, Belgium, Germany and more. Slow down, savor the details, enjoy the moment and let us share our different view. 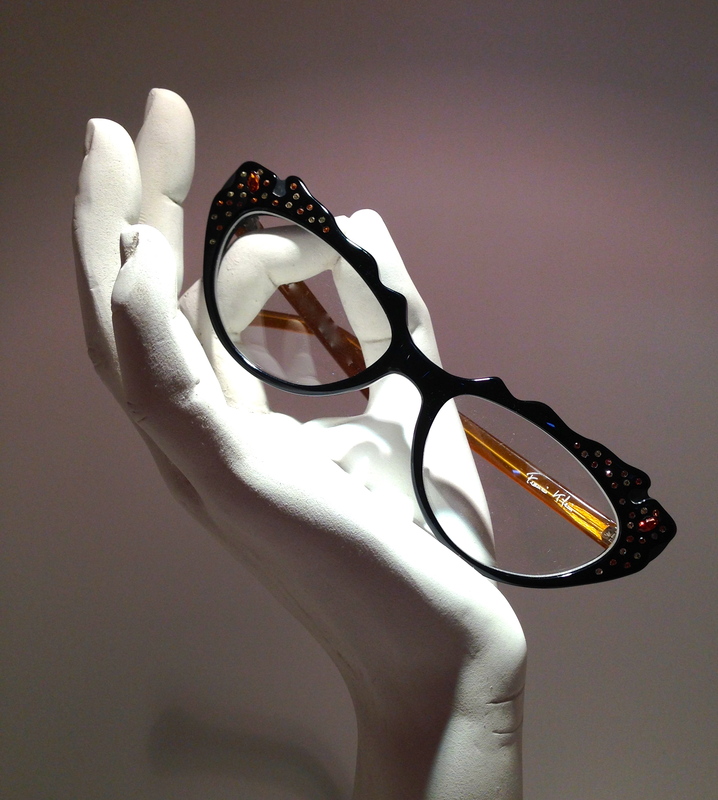 No, it’s not JUST a pair of eyeglasses, It’s art for the eyes! The View in Lynchburg is open by appointment , call for yours today. On a scale of just toe tapping to dancing around in euphoria, these glasses are euphoric dancing plus tail wagging puppy kissing fabulous! Becky fit me with glasses that make me better looking and younger when I wear them than I actually am… now for the back story. I absolutely hate shopping. I like to know what I want and get in and get out. When I found my eye sight changing and eye strain taking it’s toll at the end of the day, I dreaded having to shop for eyewear. I had heard great things about The View and it’s gracious owner Becky Causey, but I was still not looking forward to shopping. I went to the optometrist and obtained my prescription and then made my appointment with Becky. I arrived a few minutes early thinking I would do a drive by of her display case to shave time off of the anticipated ordeal of shopping. Becky invited me into her fitting area, I took a deep breath, sat down and pointed to 2 frames I had thought might work. She gently informed me that they would not flatter me and proceeded to bring out 6 pair that blew me away. My doubt and reluctance melted away with Becky’s smile and her knowledgeable advice about what eyewear would work best for me at work and play. She made the experience fun, entertaining and educational. I had a fantastic time shopping for eyewear and ended up with the best looking, best fitting pair of progressive multi-focal lenses. To make it all even sweeter when the glasses were completed and I put them on for the first time, my eyes said “AHHHHH”! Eye strain gone…I was expecting an adjustment period, you know, like being a high stepper until my eyes adjusted to the 2 different fields of correction, but there was none. The lens were perfect and Becky’s measurements for me were spot on, so no adjustment. Just smooth sailing happy eyes! It’s been 13 months and my glasses are still perfect and I now have a second pair and will probably add to my eye wardrobe more often because of the magic Becky performs with glasses. No outfit ever did for me what her glasses do for me. The afternoon I put on my new Anne et Valentin at the View, my world became a technicolor canvas of beautiful images that I never noticed the detail of. Architectural details; shades of blue, yellow and orange in the sky, and the facial details of a pedestrian across the street. These were things that seemed to shout out at me to view, as if I had a beginners mind and everything seemed new. Thank you Becky. The exceptional customer service, knowledge of the product and the professionalism she encompasses, Becky delivers the entire package and makes the shopping experience like none other. I’m often asked, “how many pair of eyeglasses do you own?”. As I have an addiction to beautiful fine eyewear the tally is always growing. It would be impossible for me to own just one pair of specs! I have the ones I wear to work and I usually work 6 days a week. I certainly don’t wear the same clothes everyday, nor the same shoes 365 days a year. Now granted, I’m a huge fan of black clothes and solid colors, so I look to accessories for my impact. I like scarves, shoes, handbags, and interestingly I wear the same jewelry just about everyday, but for my impact I choose eyewear. I have the solid black pair, the tortoise and black pair, the all tortoise pair, the matte gold cat eye, the cocktail party pair, the aqua and green pair, the vintage crystal pair which are all for work alone, and then for play…well – you get the picture. Then there’s my sunglass crush! I have the wonderful matte butterscotch slightly antique looking with the perfect vintage green lenses that I love – of course, given the right outfit; the large black glamour pair, with the perfect dark tint to compliment my skin and the frame, which every woman should own (it’s an Audrey thing); the large aviators that I adore, with a very sophisticated lens that has numerous coatings to make the look more special; the sports pair for moments when know I’m going to sweat; the garden pair that have changeable lenses, as I find I’m in and out of the garage when working in my flowers, and the happy pair that has a splash of color, and screams -I’m here for the party! I have just ordered a pair that makes me think I just might be a rock star! And why? Because I love them! I’m pretty certain I’d be very bored with just one pair of glasses and I wouldn’t hang out in the sun without my sunscreen, so why wouldn’t I protect my eyes? My name is Becky and I love fine eyewear! Wanted! Gray hair and fabulous style! I’m not certain who coined the phrase “grow old, go bold”, but it certainly holds true with eyewear. The harder one tries to look like they aren’t wearing glasses, usually the older they tend to look. Boring glasses never get the response “oh, I love those glasses”! Give up the fear making a statement, of having a strong look, or wearing a bright color! Go for it, make a statement, look like you “get it” and enjoy the ride! Posted on January 24, 2014 March 7, 2014 Leave a comment on Wanted! Gray hair and fabulous style!